At MOTIONrehab® we understand that living with physical impairment after a neurological injury, illness or disease has an impact on not only the individual but also their family and friends. It can have wide reaching implications including financial, care and support. 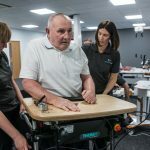 MOTIONrehab has over ten years experience in supporting individuals to reach their full potential following a life changing illness or injury such as a stroke, spinal cord injury, acquired brain injury and other neurological conditions. MOTIONrehab are renowned for their person-centred approach to rehabilitation, personalising each individuals therapy. 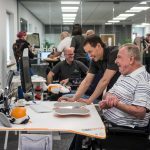 In April 2018, MOTIONrehab launched the UK’s first Intensive Outpatient Neurological Rehabilitation Centre augmented by Robotics and Virtual Reality. 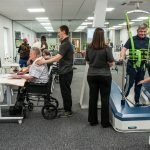 The clinic based at Asquith House, Leeds offers specialist one-to-one hands-on therapy from experienced and highly skilled clinicians and uniquely MOTIONrehab clients spend time receiving high intensity specialist rehabilitation training with robotic and virtual reality devices, individually and in groups. This allows patients to practice high repetitions of movements which is critical to neuroplasticity and the optimisation of outcomes. MOTIONrehab’s is unique in that it also offers Intensive Rehabilitation Programmes. This includes 80 hours of neurological rehabilitation over 4-7 weeks dependant on the outcome of your assessment. MOTIONrehab recognise that everybody is different and may come to us at different stages of their rehabilitation. Therefore, MOTIONrehab have three high-intensity rehabilitation options and you will be advised which is the most clinically appropriate.